I've always been a big Globe artichoke kind of girl. That was until a couple of years ago when I tried baby artichokes. Now, I have learned to divide my love between them both. Baby artichokes are fully mature artichokes, as their rich, earthy flavor attests to, but they're picked from the lower part of the plant, where they simply don't develop as much. As a result, the artichoke's characteristic fuzzy choke isn't all that fuzzy and can be eaten. In fact, other than a few tough outer loves, the entire artichoke is edible. So baby artichokes have all the flavor of their larger counterparts but without all the work. That's why they're ideal for a mid-week meal. 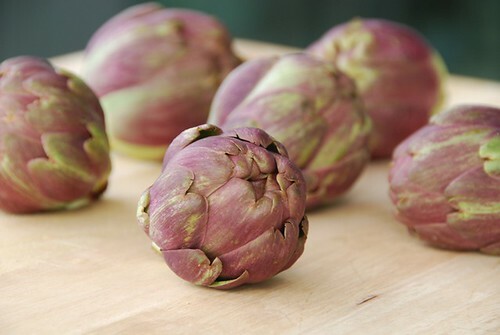 Select baby artichokes that are heavy for their size and have tight, firm, green or purple tinged leaves. White or brown streaks indicate frost bite or wind-burn; they are still edible, just unattractive. Do not, however, buy them if they're spongy or appear overly dry, brittle, or pitted. Baby artichokes can be refrigerated for up to 4-5 days, though the sooner you use them the better they'll taste. Compared to large Globe artichokes, baby artichokes are a breeze to clean. Just cut off the pointy top and the stem. Remove any tough or damaged outer leaves. Cut each artichoke in half or in quarters, and submerge in a bowl of water with lemon juice (this keeps them from oxidizing, or turning brown). Baby artichokes can be boiled, steamed, braised, roasted, and even grilled. It's a good idea to par-boil them for 2-3 minutes before roasting or grilling which helps them retain more moisture. Baby artichokes are delicious in everything from antipasto and salads to pastas and pizzas. They seem divined, however, for creamy risotto. 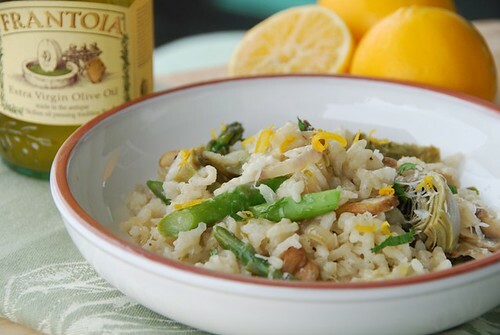 This risotto celebrates the flavors of spring with nutty baby artichokes, tender asparagus, and fragrant fresh mint. It is an intoxicating combination of flavors and textures. I have made it twice already, and now that I'm posting this, Jeff just asked, "Hey, when are you gonna make that risotto again?" Addictive, I tell you. That's why I'm sending it to Anh of the beautiful Food Lover's Journey, this week's host of Weekend Herb Blogging, created by Kalyn of Kalyn's Kitchen. In a medium sauce pan over medium heat, add 5 cups of vegetable broth. Heat through for about 10 minutes, then lower to a simmer while cooking the risotto. Meanwhile, fill a medium sized deep pot with water and the juice of 1 lemon (which prevents the artichokes from oxidizing, or turning brown) and bring to a boil. Trim the thick bottoms of the asparagus, and cut into 1-inch slices. 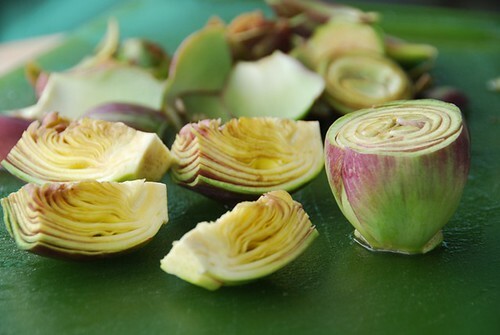 Remove any tough or damaged outer leaves of the artichokes; trim off the tops and the stems, and cut into quarters. Place in a bowl of lemon water (which keeps them from oxidizing, or turning brown). Boil in lemon water for 3 minutes, then add the asparagus, and cook 3 minutes more, or until vegetables are just tender. Drain, and plunge in a bowl of ice water to stop the cooking process. For the risotto, heat 1 teaspoon of olive oil and 1 teaspoon of butter in a large skillet over medium heat. Add diced shallots and saute 3-5 minutes, or until tender. Add the Arborio rice; toast for about 1 minute. Cook the risotto at a slow simmer, adding heated broth ½ cupful at a time. Most cookbooks will tell to stir continuously; I don’t, and you don't have to either. You can stir occasionally; just make sure the risotto absorbs the liquid before adding more. It will become tender and creamy as it cooks. Season with some salt about halfway through so it blends well, and add the white wine. 5 cups of broth usually works for this recipe, but use more or less as needed. It takes about 20 minutes for the risotto to become completely cooked. Taste it -- it should be wonderfully creamy and thick. It’s best al dente, which means it should still retain some firmness when you chew it. After about 10 minutes of cooking the risotto, place a large skillet over medium heat. Heat 1 teaspoon of olive oil, then add mushrooms. Saute 5 minutes, or until golden brown; add the drained artichokes and asparagus; cook another 3-5 minutes until vegetables are tender but not mushy. Season with salt and black pepper. At this point, the risotto should be cooked. Add the sautéed vegetables and stir. Add the lemon juice, lemon zest, and mint; stir until well combined and heated, about 1 minute. Turn off heat; then add the Parmesan cheese so it will melt more slowly. Add some additional salt and pepper, to taste. Adding 1 tablespoon of butter at this point adds a touch more creaminess, but it's optional. Plate your risotto, topping it with extra mint leaves and grated Parmesan cheese. Drizzle it with extra virgin olive oil for an extra Mmmmmm and serve immediately. This would be a luxurious risotto here, where both baby artichokes and Meyer lemons are very expensive. But if I close my eyes, I can imagine the taste of this -- so delicious! Truly a risotto after my heart. Beautiful photos of the babies! I can see why Jeff's addicted to this! I would be too! Anything with baby artichokes is near and dear to my heart! !This risotto looks soooo good! I need to find some meyer lemons here! Mama Mia! That looks good. Reminds me of Italy. The artichokes are beautiful. I would decorate my house in those colors. Delicious and wonderfully presented! A tasty risotto! Those baby artichokes look wonderful, and that risotto even more so. Full of flavours. I LOVE Rice and LOVE Artichokes... couldn't find a better dish for me!!! Thanks for sharing Susan! Oh wow... what a beautiful dish! Cute little purple things, aren't they? I've never put artichokes in risotto. Good idea. Looks like they cook up pretty quickly for this dish. I'll have to check them out sometime. I'm awaiting artichoke season with bated breath- your recipe sounds gorgeous! Your risotto looks heavenly! I think I'll need to pick up baby artichokes next time I'm at the store. Oh my goodness, those are so lovely! both your ristotto and the pictures of the artichokes! can you believe it's finally spring?? seems like winter lasted forever this year! Never heard of baby artichokes. They are tiny and cute. Where did you get them? I will look for it at Whole Foods. Susan, the baby artichokes look so cute! lydia-They're worth the extra expense. I promise. marie-They add sweetness along with the acidity. Hope you find them. bellini-Hope you find them soon! manggy-:) You're right, healthy food can be delicious. rita-Oh, please give it a try. You'll be glad you did. nuria-Then you'll have to come over, or at least check out my flickr account--it's there. lore-They do cook quickly which is why I like them for mid-week meals. suganya-Trader Joe's sells them as do major chain supermarkets such as Albertsons, Vons, and Ralphs. I'm sure, therefore, that Whole Foods would have them too. Looks delicious as usual! I love the idea of using mint. I have wanted to try using it in something savory but I have yet to do it. You're a great inspiration, Susan! These pictures are beautiful! I have never gotten myself around to making risotto with artichokes, but I must try it! I make a really tasty limoncello cream sauce with artichokes and chicken, though, which is super good :) Artichokes are awesome! i never cook with artichokes because i've always thought they were more trouble than they're worth, but baby artichokes could change my mind - especially because i love everything else in this dish. a lovely risotto susan..these artichokes are wonderful(in taste as well as preparation! 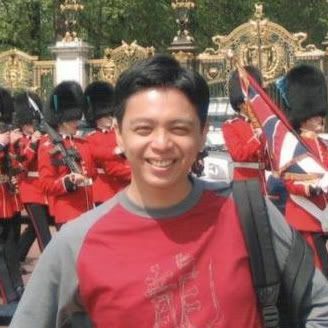 )Love your pic! That risotto looks and sounds really good. I love asparagus risotto! I wouldn't have thought of pairing them with artichokes, it sounds delicious! Susan!!! Honestly, I wish you would compile ALL of your recipes into a bound book. 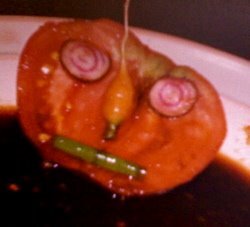 I love your photos, your stories, your choice of produce AND your recipes. Every post is a winner! Once again, I'm writing my grocery list based on one of your recipes. I can't wait to try this one! I just saw these today at Whole Foods. At first, I did not think I would be able to find them. I am going to make this tomorrow!!! I am so excited. I am going to even try it with mushrooms, even though my husband and I are not big fans. I think any mushroom covered in cheese and rice can always convince me. This dish is like the essence of spring! This is a great post. I love small, purple artichokes. I remember eating them raw -- thin shavings from the bottom that were tossed with olive oil and parmigiano. Delish. By the way, did you know that Vietnamese like to drink artichoke tea? It's one of the most popular drinks from Da Lat.All you need to do is boil the artichokes until they are totally cooked through and add rock sugar. It may sound a little strange, but it's quite good. annie-Oh, mint is wonderful in salads, salsas, and on seafood too. heather-Oh, your limoncello cream sauce sounds fabulous! I've gotta check it out. anticiplate-You could always skip the mushrooms, but they do add a chewy texture that I love. I hope you both like it! elle-That's just what I love to hear! aria-Try the Santa Monica fm. They always had the best ones. christine-I've never tried them raw before or in tea. Thanks so much for introducing these delicious ideas to me. Very spring! =) The colours look amazing in this. I've had a hankering for risotto this week. This looks lovely! I wish I could find some gorgeous baby artichokes like that - what delicious-looking spring dish! Anything (and everything) in risotto. They look wonderful and I always like easy..
Beautiful risotto- adore artichokes; I'm going to star this and have a proper read through it now. Looks great! Love the little artichokes. I think I've only had big ones. This sounds really delicious, great combination of flavors. Such a beautiful risotto dish! Love it! Thanks for a delicious-looking recipe! I'm sure it will taste wonderful!